I RIDE FOR LIVESTRONG by Purpose in the NY Times Media Decoder Blog! I was in charge of the music and audio and also worked on animation and visual/interaction design. A new agency whose name, Purpose, signals the kind of campaigns it hopes to produce is creating for Livestrong, the Lance Armstrong initiative that fights cancer, a virtual version of an annual bicycle race. 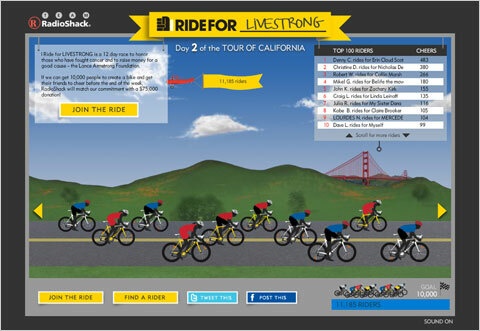 The effort is in the form of a game called I Ride for Livestrong. The online race began on Wednesday and continues through May 23, which is the end date for the actual race it mirrors, the 2010 Amgen Tour of California. I started a new job last Thursday at Human Rights Watch. My official job title is Associate in Development and Outreach. I’ve spent the first few days getting settled in, oriented, and setting up meetings. The office is half empty right now since many of the staff are out on holiday, but things should pick up soon. More later!